The dsp.SineWave System object™ generates a real or complex, multichannel sinusoidal signal with independent amplitude, frequency, and phase in each output channel. For both real and complex sinusoids, the Amplitude, Frequency, and PhaseOffset properties can be scalars or length-N vectors, where N is the number of channels in the output. When you specify at least one of these properties as a length-N vector, scalar values specified for the other properties are applied to each of the N channels. Create the dsp.SineWave object and set its properties. sine = dsp.SineWave creates a sine wave object that generates a real-valued sinusoid with an amplitude of 1, a frequency of 100 Hz, and a phase offset of 0. By default, the sine wave object generates only one sample. sine = dsp.SineWave(Name,Value) creates a sine wave object with each specified property set to the specified value. Enclose each property name in single quotes. sine = dsp.SineWave(amp,freq,phase,Name,Value) creates a sine wave object with the Amplitude property set to amp, Frequency property set to freq, PhaseOffset property set to phase, and anyother specified properties set to the specified values. scalar –– A scalar applies to all channels. vector –– A length-N vector contains the amplitudes of the sine waves in each of the N output channels. The vector length must be the same as that specified for the Frequency and PhaseOffset properties. This property is tunable only when you set Method to either 'Trigonometric function' or 'Differential'. vector –– A length-N vector contains the frequencies of the sine waves in each of the N output channels. The vector length must be the same as that specified for the Amplitude and PhaseOffset properties. vector –– A length-N vector contains the phase offsets of the sine waves in each of the N output channels. The vector length must be the same as that specified for the Amplitude and Frequency properties. false –– The waveform output is real. true –– The waveform output is complex. 'Trigonometric function' –– The object computes the sinusoid by sampling the continuous-time function. 'Table lookup' –– The object precomputes the unique samples of every output sinusoid at the start of the simulation, and recalls the samples from memory as needed. 'Differential' –– The object uses an incremental algorithm. This algorithm computes the output samples based on the output values computed at the previous sample time and precomputed update terms. 'Speed' –– The table contains k elements, where k is the number of input samples in one full period of the sine wave. The period of each sinusoid must be an integer multiple of 1/Fs, where Fs is the value of the SampleRate property value. That is, each element of the Frequency property must be of the form Fs/m, where m is an integer greater than 1. 'Memory' –– The table contains k/4 elements. This property applies only when you set the Method property to 'Table lookup'. Sample rate of output signal in Hz, specified as a positive scalar. Number of consecutive samples from each sinusoid to buffer into the output frame, specified as a positive integer. Data type of the sine wave output, specified as 'double', 'single', or 'Custom'. Output word and fraction lengths, specified as an autosigned numeric type with a word length of 16. This property applies only when you set the Method property to 'Table lookup' and the OutputDataType property to 'Custom'. sineOut = sine() creates the sine wave output, sineOut. Sine wave output, returned as a vector or matrix. The SamplesPerFrame property determines the number of rows in the output matrix. If the Frequency or the PhaseOffset property is a vector, the length of the vector determines the number of columns (channels) in the output matrix. If the Frequency or the PhaseOffset properties is a scalar, then the number of channels in the output matrix is 1. The OutputDataType property sets the data type of the output. 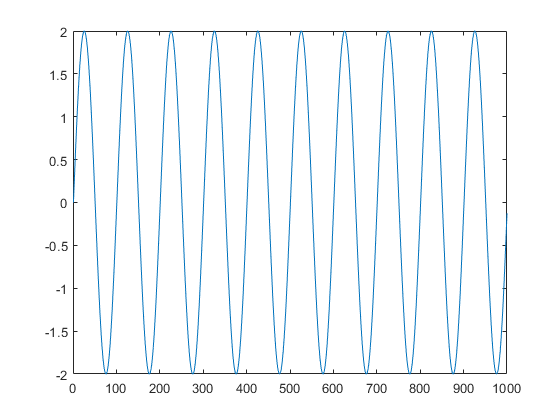 Generate a sine wave with an amplitude of 2, frequency of 10 Hz, and an initial phase of 0. 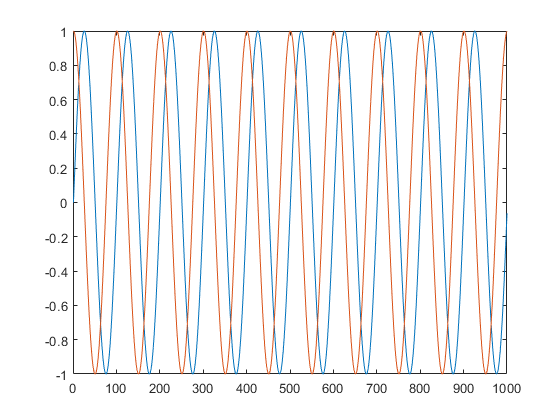 Generate two sine waves offset by a phase of pi/2 radians. where A is the amplitude, f is the frequency in Hz, and φ is the initial phase, or phase offset, in radians. with a period of Ts, where you specify Ts in the sample time. At each sample time, the algorithm evaluates the sine function at the appropriate time value within the first cycle of the sinusoid. By constraining trigonometric evaluations to the first cycle of each sinusoid, the algorithm avoids the imprecision of computing the sine of very large numbers. This constraint also eliminates the possibility of discontinuity during extended operations, when an absolute time variable might overflow. This method therefore avoids the memory demands of the table lookup method at the expense of many more floating-point operations. The table lookup method precomputes the unique samples of every output sinusoid at the start of the simulation, and recalls the samples from memory as needed. Because a table of finite length can only be constructed when all output sequences repeat, the method requires that the period of every sinusoid in the output be evenly divisible by the sample period. That is, 1/(fiTs) = ki must be an integer value for every channel i = 1, 2, ..., N.
When the algorithm optimizes the table of sine values for Speed, the table constructed for each channel contains ki elements. When the optimization is for Memory, the table constructed for each channel contains ki/4 elements. For long output sequences, the table lookup method requires far fewer floating-point operations than any of the other methods. However, the method can demand considerably more memory, especially for high sample rates (long tables). This method is recommended for models that are intended to emulate or generate code for DSP hardware, which need to be optimized for execution speed. The lookup table for this object is constructed from double-precision floating-point values. When you use the Table Lookup computation mode, the maximum amount of precision you can achieve in your output is 53 bits. Setting the word length of the output data type to values greater than 53 bits does not improve the precision of your output. The differential method uses an incremental algorithm. This algorithm computes the output samples based on the output values computed at the previous sample time (and precomputed update terms) by making use of the following identities. where you specify Ts in the sample time. Since Ts is constant, the right-hand matrix is a constant and can be computed once at the start of the simulation. The value of Aisin[2πfi(t+Ts)+ϕi] is then computed from the values of sin(2πfit+ϕi) and cos(2πfit+ϕi) by a simple matrix multiplication at each time step. This mode offers reduced computational load, but is subject to drift over time due to cumulative quantization error. Because the method is not contingent on an absolute time value, there is no danger of discontinuity during extended operations, when an absolute time variable might overflow.